Known sometimes as "Shiny burrowing scorpions" or "Yellowlegged creeping scorpions". Africa (Botswana, Mozambique, South Africa, Tanzania, Zimbabwe). This scorpion is known from dry areas with different temperature regimes (in areas with occational frost to areas with temperatures over 40 degrees). Its distrubution appears to be determined by soil hardness rather than soil type. Sandy soil seem to be avoided because this soild type makes it difficult to burrow. Little data known, but sting is probably moderate painful. This species has no medical significance for healthy humans (an anecdontal source says that the venom can have unpleseant systemic effects, but this has not been verified). This species will sting readilly, and has very powerful pincers which can pinch very painful. Gaban, D. (1997). On: Opistophthalmus glabrifrons (Peters). Forum American Tarantula Society 6(6), p. 196. Some information made by The South African Museum. 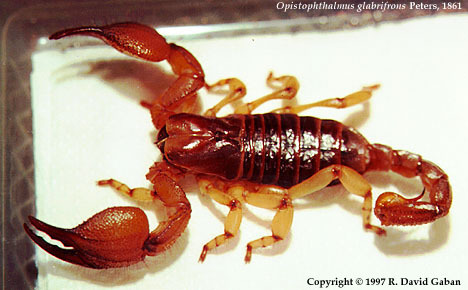 This species is a medium-sized, have-built scorpion with large pedipalps. Varying color, but usually yellow-brown to rust-brown. The pedipalps, legs, metasoma (tail) and telson are lighter in color than trunk and the posterior part of the carapace. The adult size of this species is 9-11.5 cm. Males in this species have longer and thicker metasomas (tails) and a more elongated pedipalp hand. This species are known to stridulate (making a hissing sound) loudly when disturbed. The sound is made when the scorpion is rubbing its chelicerae together. All scorpions in the genus Opistophthalmus stridulate. The burrows of this scorpion are often constructed with a shallow scrape under a rock that leads to the burrow. The burrows vary from 10 mm to 1 metre deep, and can sometimes run to a lenght of 1.5 metres. The burroes often spural anticlockwise as they decend. Burrows in softer soil is usually shorter than burrows in harder soil. The mouthparts are used for breaking up the soil. This species is kept in captivity. Captive breeding from wild caught females has been reported, but mating in captivity seems difficult. This species has a slow growth rate. Opistophthalmus glabrifrons photo by Dave Gaban (C).